This weekend, Honda of America Mfg., Inc. surpassed $100 million in donations to Ohio communities. The company reached the milestone with a $15,000 gift to Keep Ohio Beautiful to be used to create a sugarbush at Camp Willson in Bellefontaine. As part of the project, volunteers worked to plant sugar maples and other native Ohio hardwoods at the camp. Above, from left, children Mason, Regan and Kaiden along with their mother, Melissa Johnson, help with the planting. With its most recent round of charitable giving, Honda of America Mfg., Inc. has surpassed $100 million in philanthropic contributions to local Ohio communities. Honda of America, which celebrates its 40th anniversary this year, reached the milestone with a gift Saturday of $15,000 to Keep Ohio Beautiful. This three-year project will benefit YMCA’s Camp Willson in Bellefontaine. 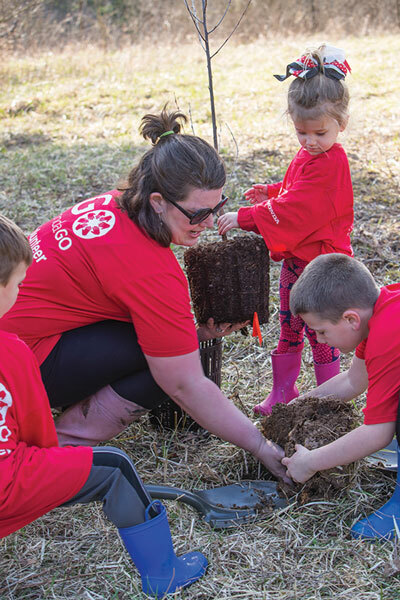 Volunteers spent part of the day planting sugar maples and other native Ohio hardwoods to create Camp Willson’s first sugarbush, which is set to be the first phase of a new arboretum. A sugarbush is a forest stand often utilized for maple syrup. Maple trees often dominate the tree canopy. Since beginning production in Marysville, in 1979, Honda of America’s charitable giving programs have supported many local initiatives. These include grants to hospitals, STEM organizations, community centers, theaters, food banks, after-school programs, nature preserves and camps. Honda’s $100 million total includes more than $58 million in corporate contributions, $28 million from Honda associate contributions and $14 million in donations from the Honda of America Foundation in Ohio. While Honda has collaborated directly with a wide range of charitable organizations, the company’s associates have played a key role in carrying out community initiatives as well. Over the past four decades, Honda’s associates have volunteered more than 100,000 hours of service to Ohio community activities. “Together, with the help of many Honda volunteers, we’ll establish a working forest that will benefit future generations,” Wise said. As a state affiliate of Keep America Beautiful, Keep Ohio Beautiful serves as Ohio’s umbrella organization for more than 40 local affiliate organizations in numerous Ohio communities. “By providing a strong support system and the sharing of best practices, Keep Ohio Beautiful enables volunteers in communities throughout Ohio to improve waste handling practices, litter prevention, recycling, beautification and community greening efforts,” according to the release.